The Monuments Men – It was the greatest art heist in history. Screenplay by George Clooney and Grant Heslov. Based on the Book by Robert M. Edsel and Bret Witter. George Clooney directs this excellent movie based on a group of men who are being tasked with finding and returning all the art that Germany has stolen during World War 2. The team gets put together and head to Europe and that is where their mission begins. 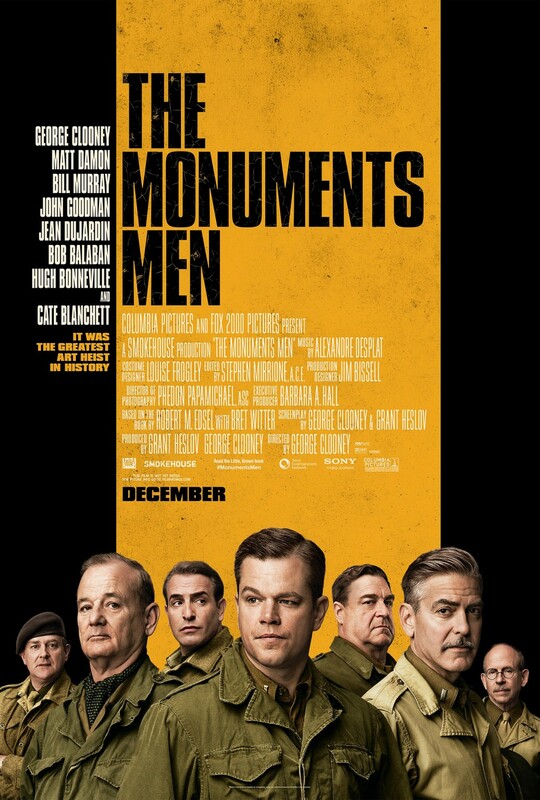 Frank Stokes (Clooney) leads this group of men and when they go in different directions they try to get information on where the stolen art is being hidden. Claire Simone (Blanchett) worked for a German that was involved in the thefts from all the countries that Germany invaded. James Granger (Damon) goes to France where he meets Claire who does not trust him or his intentions. There are American soldiers that will not hesitate to bomb a building regardless of what art might be stored in the building. There are Russians who are stealing art for themselves they are called the Trophy Brigade. Hitler issued the “Nero Decree” which was an order to destroy all infrastructure, supply depots, transport and communication facilities, industrial establishments in the event that Germany loses the war. These brave men battling overwhelming odds did their best to preserve these works of art and return them to their rightful owners. This is an entertaining movie which also gives us a history lesson and reinforces the fact that art helps define a society. If you liked this try: Saving Private Ryan, Pearl Harbour, Schindler’s List.